Tim was back again catching another awesome Palm Tree Arapaima as well as some huge giant featherbacks and Amazon redtails. 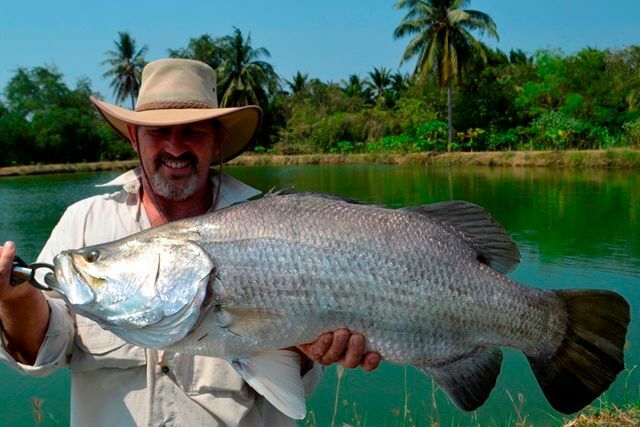 He also caught some good sized rohu and some barramundi from the Palm Tree Barra ponds. 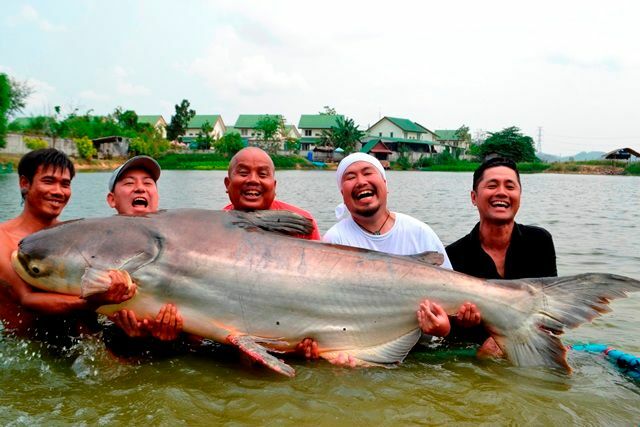 A group of angling buddies from Japan took it in turns in battling and successfully landing this monster 300lb+ mekong catfish joining the Palm Tree 300lb Catfish Club in the process. 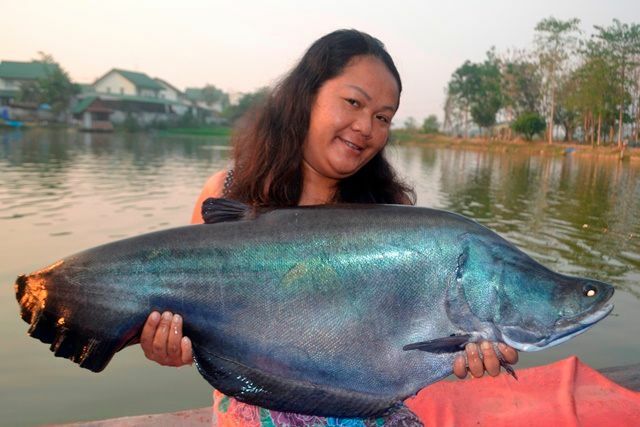 They also caught a number of Amazon redtail catfish and a tambaqui. 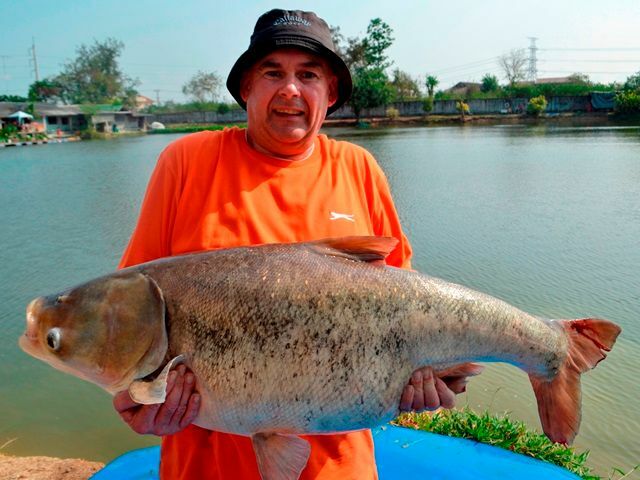 Micky Qualye caught some absolutely stunning fish that included a huge Chinese bighead carp and a cracking pacu. 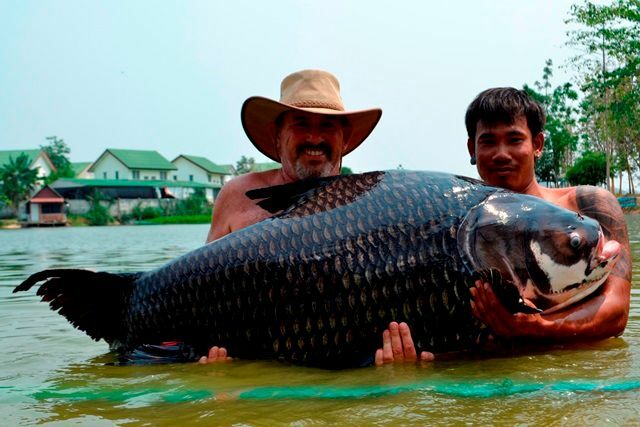 He didn't stop there catching a large variety of other fish species such as mekong catfish, wallago attu, Amazon redtail, catfish shark and striped catfish. 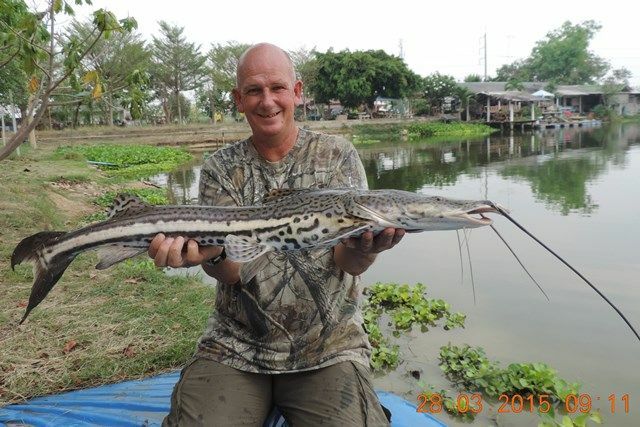 Baz Wright certainly got into the rarer species at Palm Tree catching a seldom caught cobra snakehead, giraffe catfish and tiger catfish. 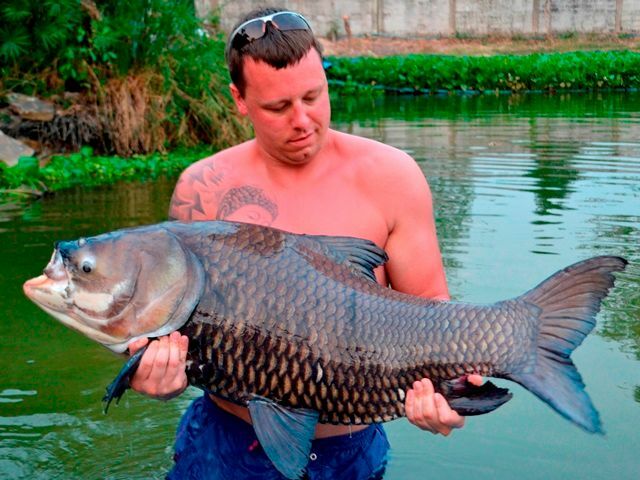 He also caught a lot of the more commonly caught species like rohu, tambaqui, mekong catfish, clown featherback, giant gourami, wallago attu, big-Y, Amazon redtail, catfish shark, chao phraya catfish, Siamese carp and striped catfish. Regular Andy Harman decided to have a session down on the Palm Tree Barra ponds and no surprise had no problem in bagging up. Andy Rutherford another Palm Tree first timer was soon into the fish catching the biggest marble catfish caught at Palm Tree to date. 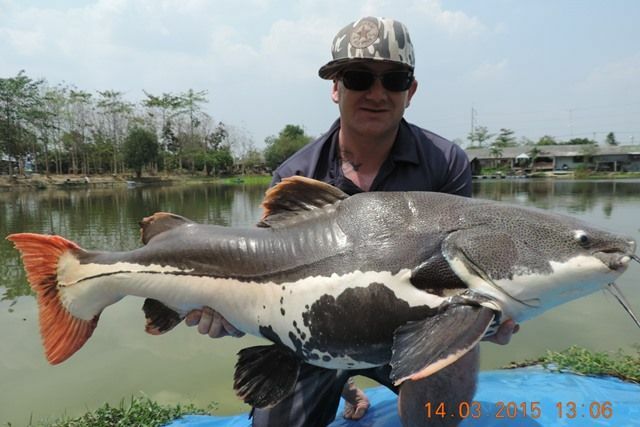 In addition he caught a huge variety of other awesome fish that included mekong catfish, giant featherback, Thai and Amazon redtailed catfish, mrigal, catfish shark, leopard catfish and rohu. 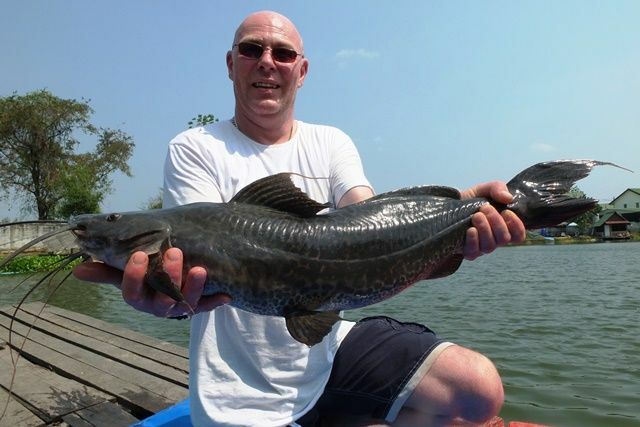 John Deakin having finished his stint of guiding at Gillhams made his long awaited trip to Khao Laem Dam with Tim on his quest to catch a wild giant snakehead. Despite the fish being put down by a huge thunder storm he still managed to catch his quarry. 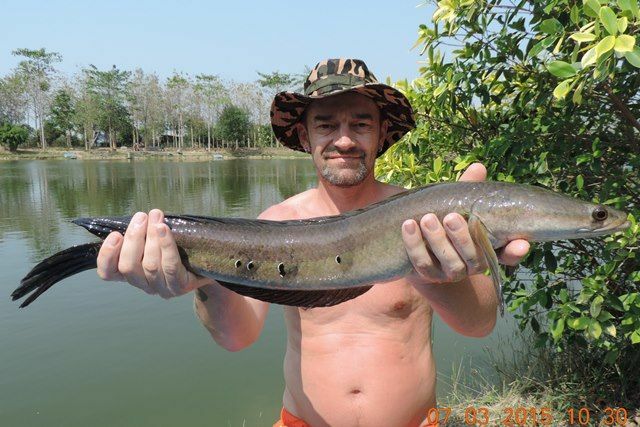 James Rawle came up from Pattaya for a session and caught a number of new species for him that included a Juliens golden price carp, wallago leeri, tambaqui and a Chinese highfin catfish. 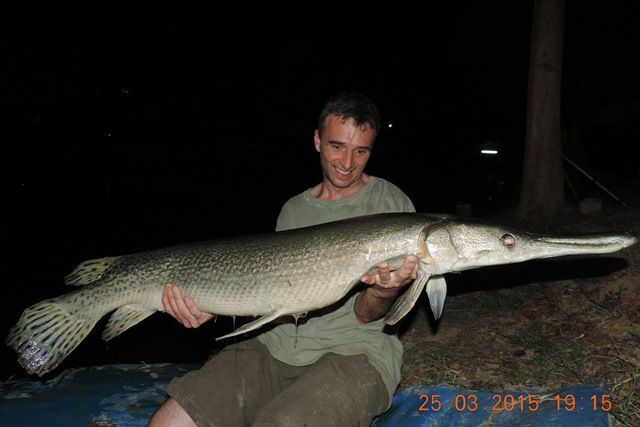 He also broke a couple of pb's with an Amazon redtail of around 40kg and a very plump mollycot. Andy Harman returned to the Palm Tree Barra Ponds to let his fishing mate from the UK Dan have a go. 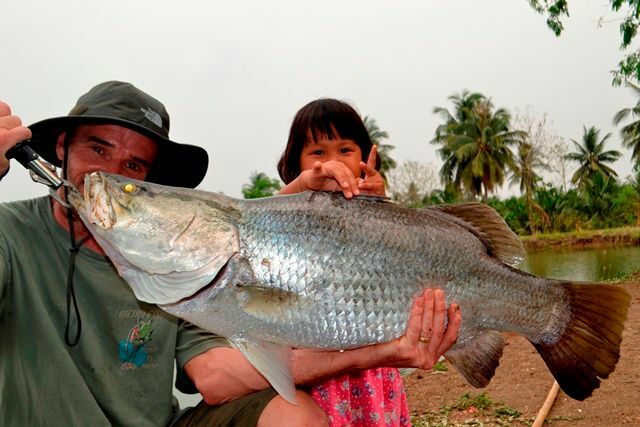 It was another session of bagging up on some very acrobatic barramundi. Regular Sean Skeels was also back at Palm Tree during the month. 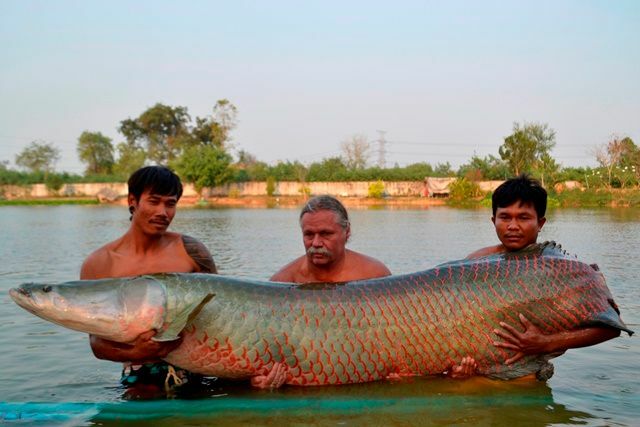 He caught a number of impressive fish such as a pb Siamese carp, albino pacu, Amazon and Thai redtailed catfish, alligator gar, wallago attu, striped catfish, African walking catfish, chao phraya and rohu. John Harvey brought up his bread punch form Pattaya for another session. 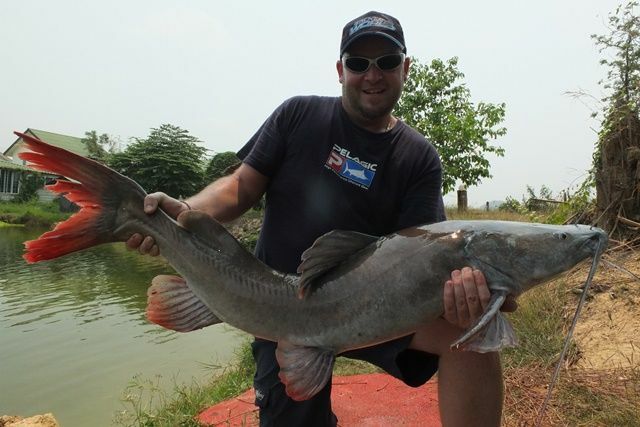 As with his last session he played a monster mekong catfish for over two hours only to suffer the same heart break and loose it. 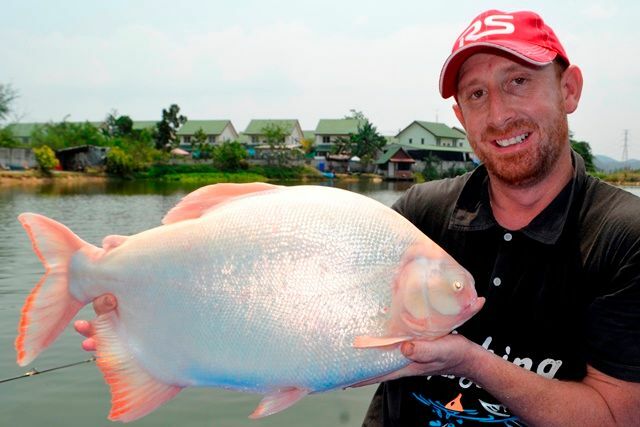 But he did manage to land an awesome albino pacu a new species for him and a decent sized mekong. He caught a number of other nice catches that included crystal eyed catfish, giant gourami., rohu, Amazon redtail and Siamese carp. The guides didn't get much time for fishing during the month but did manage to catch some huge giant featherback on worms. Allan Pagett was plagued by big Amazon redtailed catfish all day and was totally bushed by the end of it. 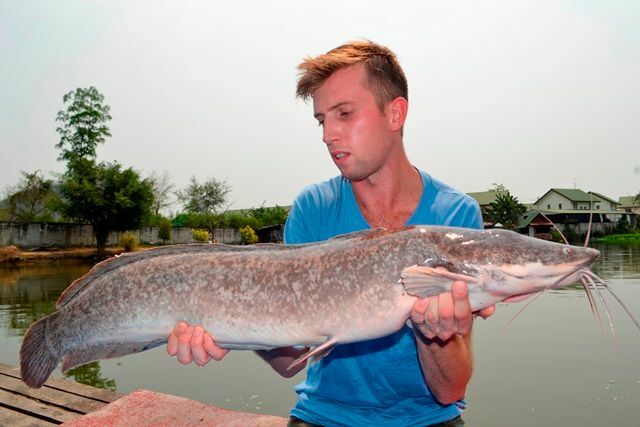 He did manage to catch a couple of other species in between namely a rohu and an African walking catfish. 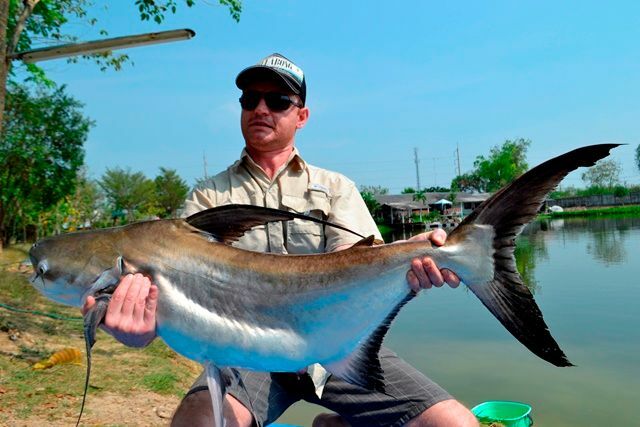 Jordan Reid returned briefly before returning home ot Western Australia catching some nice Thai and Amazon retailed catfish.